The protest included a march and street sit-in, office occupation, and a sit-in occupation in the foyer of the QV1 building, the Perth Headquarters for BP and Chevron in Western Australia. John Englart reports using social media. Perth is home to the largest concentration of oil and gas companies with more than 300 international companies in the sector now based in the city. Western Australia is also a regional base for more than 40 major oilfield service companies. One of the people refusing to leave the QV1 building was University Student Aleesha. In a statement she highlighted that occupants of the building directly contribute to the injustice that the world is experiencing. “Australia is currently the largest exporter of coal and W.A. is working towards being the largest exporter of gas. These trajectories will thrust us into unnecessary, irresponsible, catastrophe. On the other hand if we act critically, with the power, knowledge and resources we have great access to, the story of our future can be changed. Through a just transition to renewable energy we could provide a safe climate." 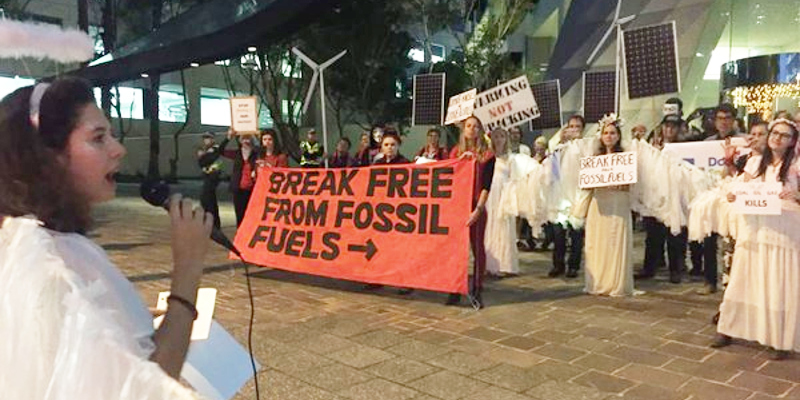 We know that the only way to prevent catastrophic climate change is to ensure fossil fuels are kept in the ground.” said Aleesha. Aleesha was joined in her civil disobedience by retired nurse Cathy, and academic Richard, who decided he could no longer stand by and wait for ‘someone else’ to solve the problem. “I’m doing this for my son, his children, the future generations, and all the ecosystems of this planet. They are the ones who are going to bear the true costs of this time," said Richard. Richard's warning comes as the Great Barrier Reef has experienced it's worst coral bleaching on record, with scientists saying this is due to climate change warming of the oceans rather than this year's El Nino. It is not only the Great Barrier Reef, but also Western Australia's Kimberley Coast and Christmas Island that have suffered massive coral bleaching. Reef ecosystems are facing a bleak future facing coral bleaching events every other year in twenty years time with current emission trends. Saving the reef may not be so easy to do warns climate activist and author David Spratt. Video compilation from Perth. The police really didn't like the street sit-in, ordering the crowd to move-on, but were a little intimidated in proceeding to the next stage of arrests. There is no more business as usual. Political intransigence has wasted too much time. Breakfree2016 from Katie H on Vimeo.